A captivating picture book biography of a boy who imagined a world full of dragons and grew up to be beloved author J. R. R. Tolkien. John Ronald loved dragons. He liked to imagine dragons when he was alone, and with his friends, and especially when life got hard or sad. After his mother died and he had to live with a cold-hearted aunt, he looked for dragons. He searched for them at his boarding school. And when he fought in a Great War, he felt as if terrible, destructive dragons were everywhere. But he never actually found one, until one day, when he was a grown man but still very much a boy at heart, when he decided to create one of his own. 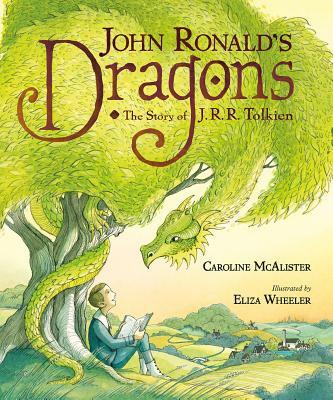 John Ronald's Dragons, a picture book biography by Caroline McAlister and illustrated by Eliza Wheeler, introduces the beloved creator of Middle Earth and author of The Hobbit and The Lord of the Rings to a new generation of children who see magic in the world around them. Caroline McAlister's father was an English professor and she grew up in a house full of books. On weekends for fun the family went to used bookstores. Like her father, she now teaches English to college students, but as a young child she wanted to become an author of children’s books. Now in her second career she has returned to her earliest aspirations. When she is not reading or writing you may find her playing tennis, cooking strange vegetarian meals, or quilting some of the fabric scraps she has hoarded. She is married to a philosophy professor. They have two fierce, smart daughters, and a large, loopy Labrador retriever. Eliza Wheeler is the author-illustrator of MISS MAPLE'S SEEDS (Penguin), which debuted on the New York Times Best Seller list. She has illustrated many children’s books, including JOHN RONALD’S DRAGONS: THE STORY OF J.R.R. TOLKIEN (Caroline McAlister), TELL ME A TATTOO STORY (Alison McGhee), WHEREVER YOU GO (Pat Zietlow Miller), and Newbery Honor winning novel DOLL BONES (Holly Black). Eliza received the SCBWI National Grand Prize Award for best portfolio in 2011. She lives with her husband in Minnesota.